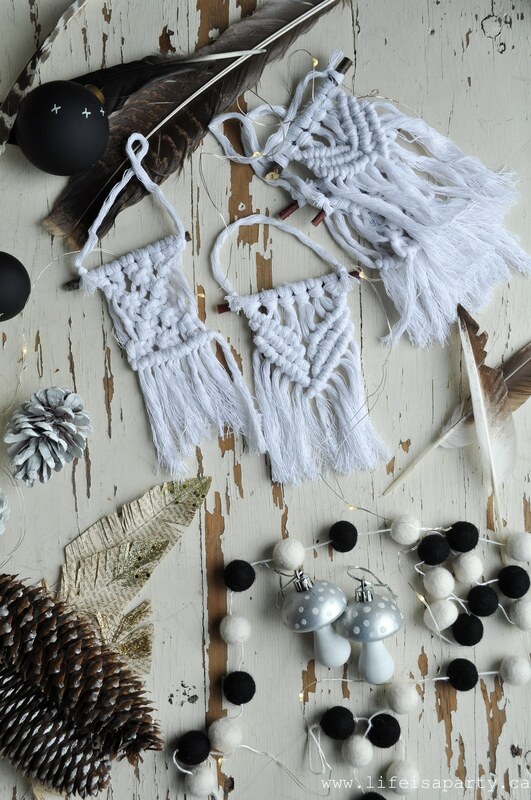 Mini Macrame Christmas Ornaments: Easy DIY Macrame Ornament tutorial, perfect for the beginner. 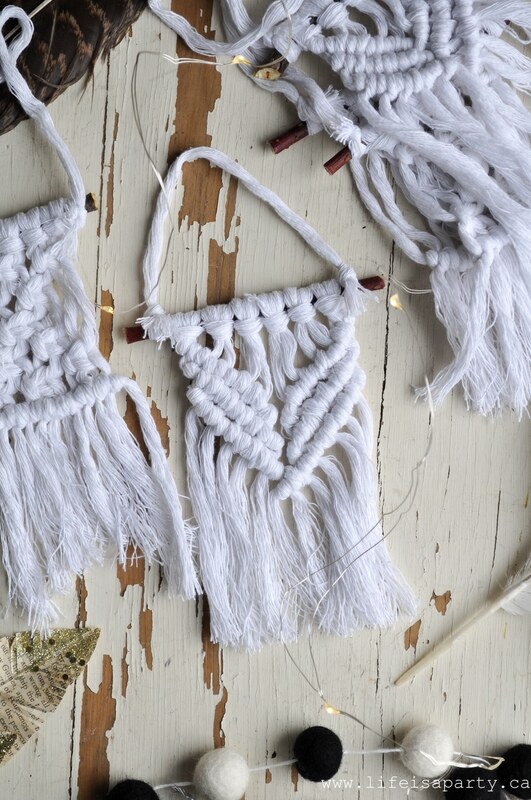 No macrame experience required. 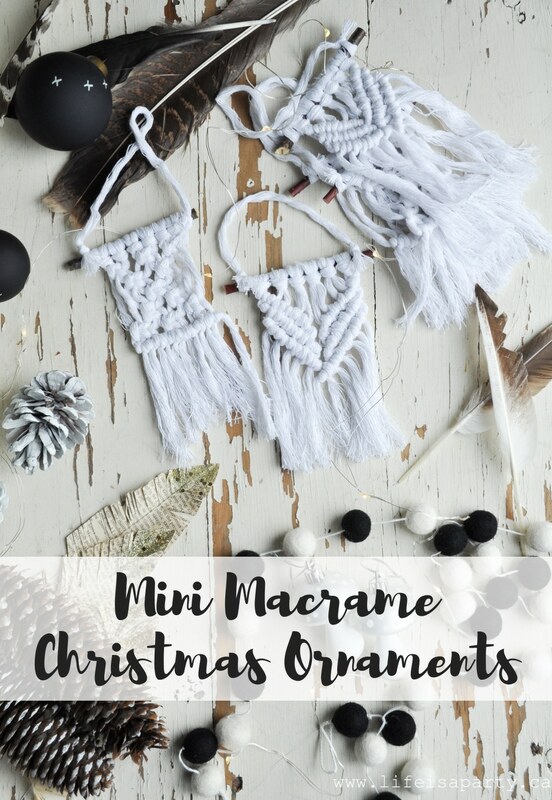 I love making a few homemade Christmas decorations each year, and this year these mini macrame Christmas ornaments turned out so cute. 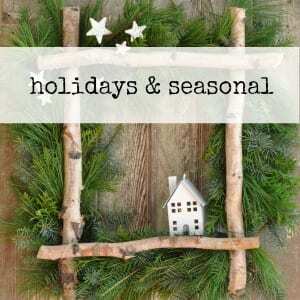 I’m joining in with the Seasonal Simplicity Christmas Series again this week, hosted by The Happy Housie. 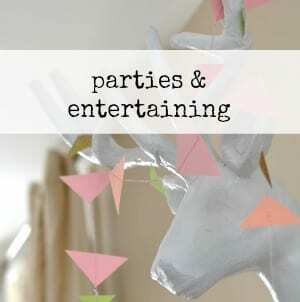 This week we’re sharing Christmas Ornament ideas. Did you see my Modern Boho Christmas Wreath last week? These two designs use only three simple knots, the lark’s head, the square knot, and the double half hitch -I’m not counting the diagonal half hitch, since it’s just a variation. 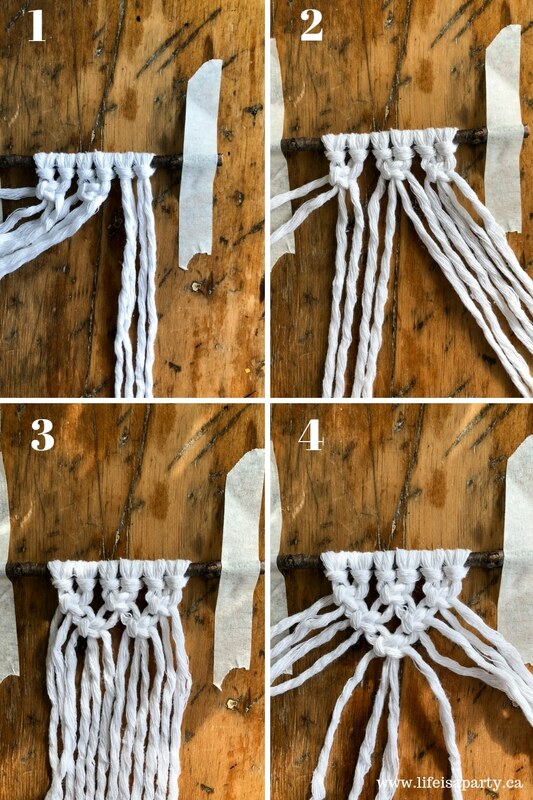 Macrame is actually really easy once you get the hang of it. I’ve taken step by step photos to help, but if you’re still struggling, just watch a quick video on-line of the knot you’re stuck on. Once you get it, you’re good. It’s just the same few knots over and over. To get started cut a small twig and use the lark’s head knot to attach 6 cords to the top. 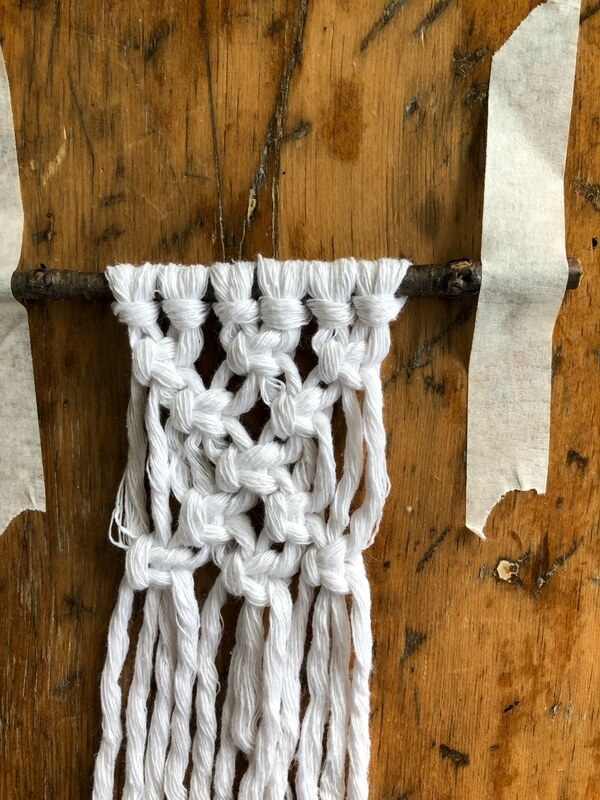 I used rope, so before I added it to the twig I un-wound it and turned it from 3 ply to single ply. Each cord should be about 2 feet long. To tie a lark’s head knot, 1st fold the cord in half and then lie the middle of it over the top of the twig. 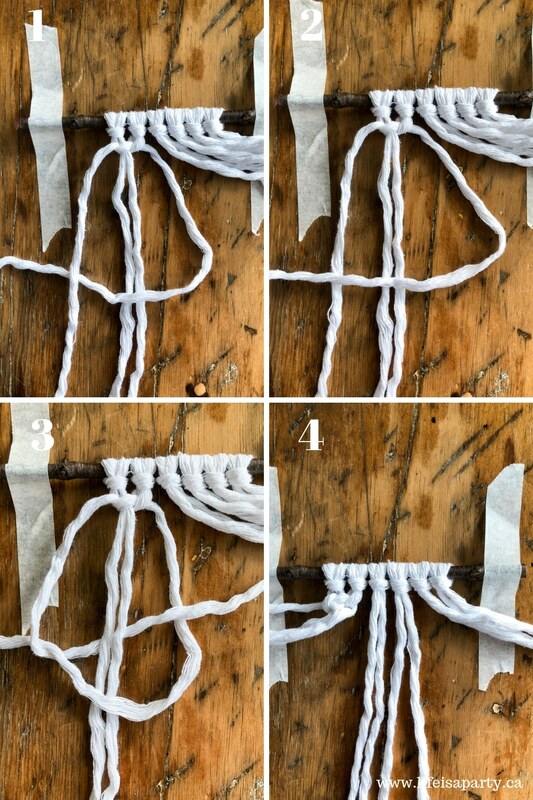 Fold the loop over the back of the twig, and then pull the two ends through the top. Pull tight. Repeat for all 6 cords. Once the cords are onto the twig it’s time to start the first row, which will be three square knots. These knots are tied with four cords, so start on the left and separate out the first four cords. To make the square knot take the left hand cord pull it out so it looks like a number “4” shape is forming. Next tuck the end of the 1st cord under the 4th cord. Then, bring the end of the 4th cord up and behind the middle two cords and through the space between the 1st and 2nd cord that looks like the four. 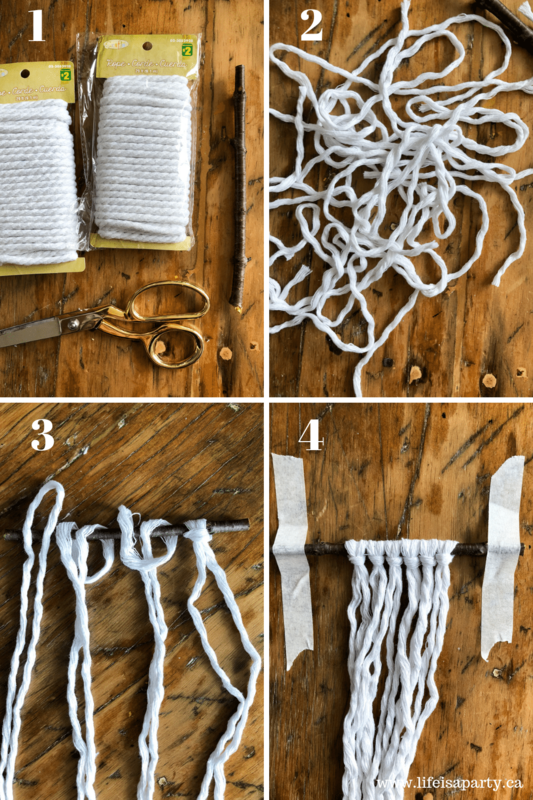 Pull the ends of the 1st and 4th cord to tighten and move that knot up to the top. This is the first half of a square knot. For the second half of the square knot, you’re going to do the exact same thing, but in the other direction. 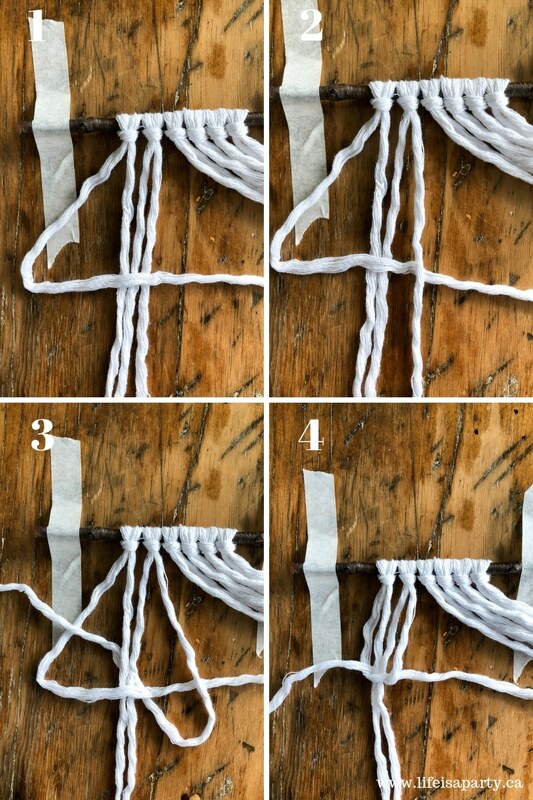 You’re going to make your “4” shape with the 1st and 4th cord, but with the “4” backward, facing the right side. Then pull the 1st cord over the 4th. Then feed the tail of the 1st cord under the 2nd and 3rd cord and up through the opening of the “4” shape. Pull the ends of the 1st and 4th cord to tighten and you have your first square knot. Keep working in sections of four cords. Tie another square knot and another square knot to make 3 along the top row. For the second row, you’re only going to do 2 square knots. To do this start by separating out the first to cords. The next four cords are for the second square knot on row 2, followed by the next one. That will leave the other two cords out on the other end too. For the third row, use only the centre four cords of the row to tie one square knot. You will find you might need to adjust your tension, try to keep the knots all equally tightened and spaced. For row 4, repeat row 2 with 2 square knot again, leaving out the two cords on either side. For row 5, repeat row 1 with 3 square knots. You could finish this ornament there with the square knots, or like I did, add a row of half hitch knots. To do the half hitch knot, take the 1st cord in the row, and pull across the piece horizontally. This will be your lead cord. Take the 2nd cord from behind and over the lead and through the hole you’ve created. Now do that exact knot again with the same 2nd cord. That is one half hitch. Proceed along the rest of the cords, taking care to keep the lead cord pulled across horizontally and straight bending the other cords around it. To tighten the knots, pull the lead cord. 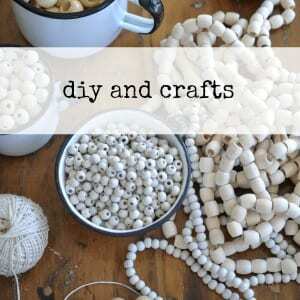 To finish the piece, cut the ends straight across, or into a downward or upwards “V” at the bottom. Then use a hairbrush or comb to brush out the cord and create the fringe bottom. You might have to re-trim the shape a little after you brush it out. Finally trim the ends of the twig, and add a piece of cord to hang the ornament from. The second mini macrame Christmas ornament I made was using the diagonal half hitch. It’s much like the half hitch we used on the first one, just at a diagonal. Start this ornament by adding 6 cords to a twig with a lark’s knot, just like the first one. 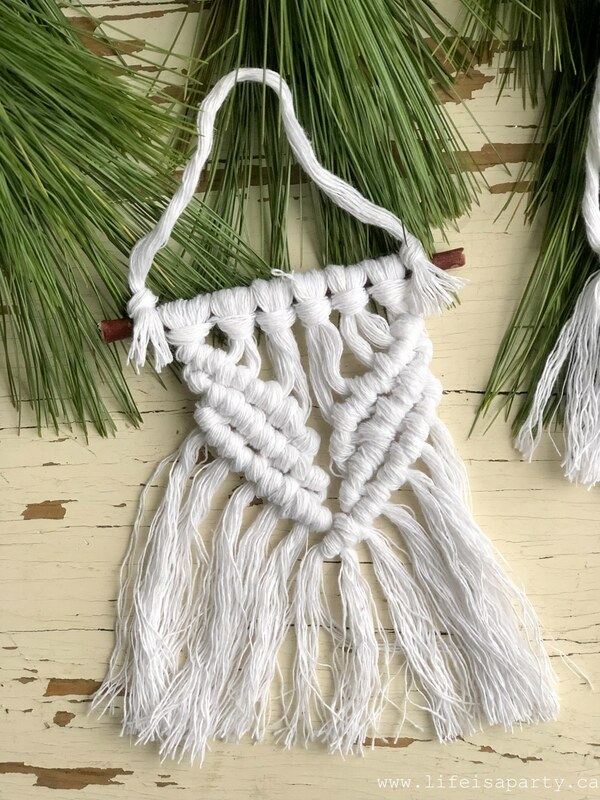 To make this ornament, you make three rows of diagonal half hitch knots that form a “V”. 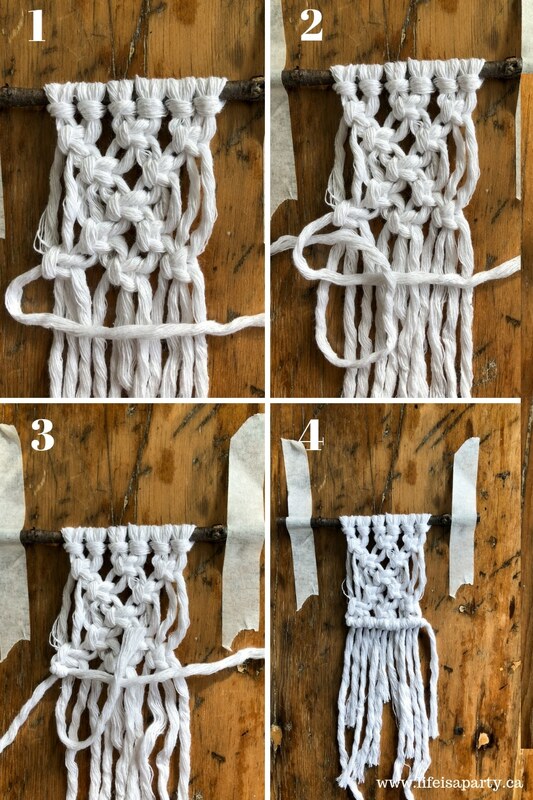 The first cord will be your lead cord, holding it at a diagonal this time instead of horizontally, loop the 2nd cord up and over it, and through the hole you’ve created. Then do that again with the 2nd cord to complete the half hitch knot. Holding the lead cord firmly at a diagonal, tie a half hitch with the 3rd cord slightly lower down, on the diagonal of your lead cord. Repeat this for the first 6 cords. Then pick up the last cord, the 12th cord on the far right, and use it as the lead cord and tie half hitches from the other direction to meet in the centre. For row 2, repeat the same as row 1. But this time when you meet up in the centre, you can use the cord from the other side to link the 2 sides of the “V” together, as seen in picture 2 of the collage above. 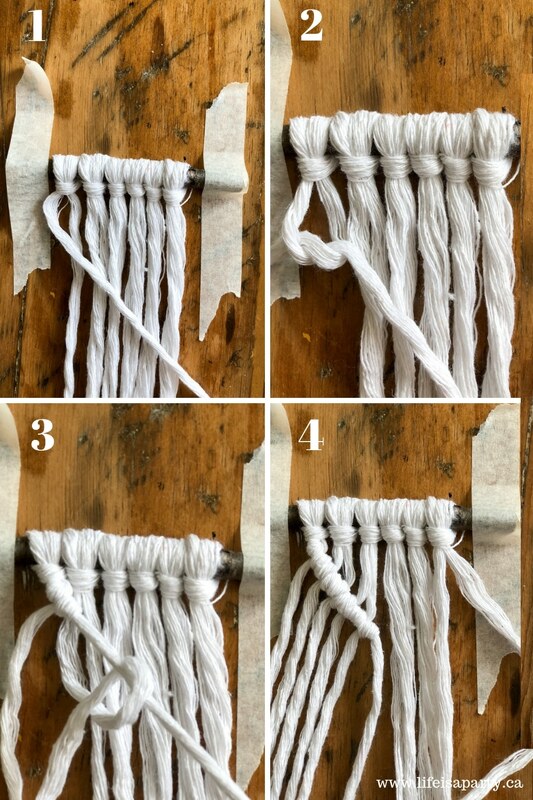 To finish the ornament, trim the edges of the cord along the bottom, and brush out the fringe just like the first one. Finally trim the twig ends and add a hanging cord. 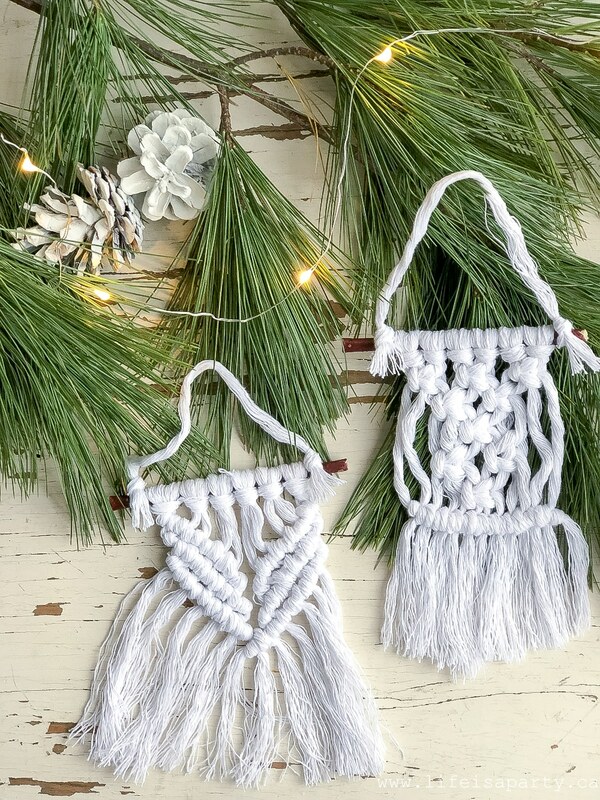 I made three of each kind, and I can’t wait to add them to my Boho themed Christmas tree. 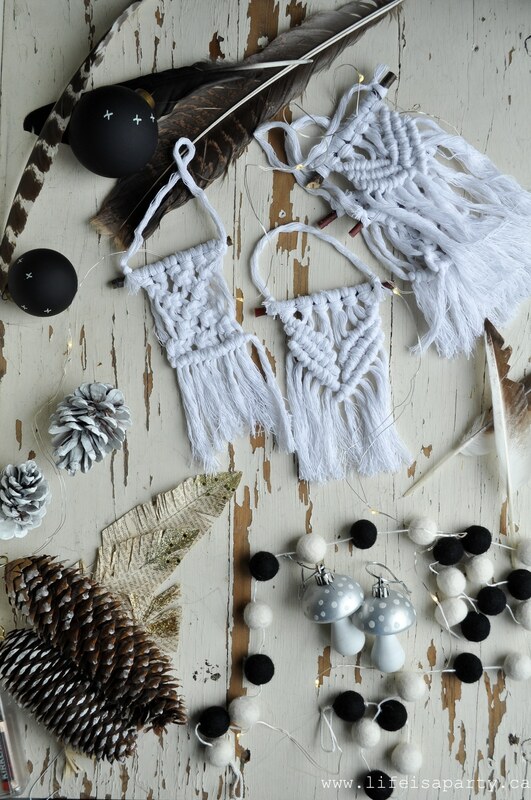 With easy DIY Mini Macrame Christmas Ornaments, life really is a party! 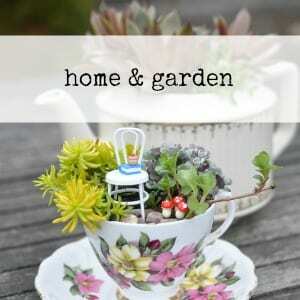 Now want some more inspiration be sure to check out all these amazing Christmas Ornament ideas. 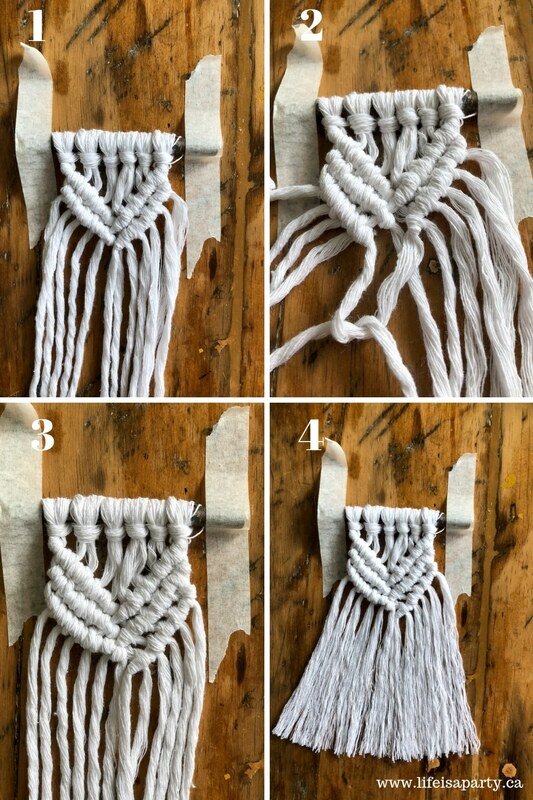 OK so I’ve been wanting to learn macramé but wasn’t sure if it would be hard or not but just seeing how this one is done it seems like something I can handle!!! These are adorable. 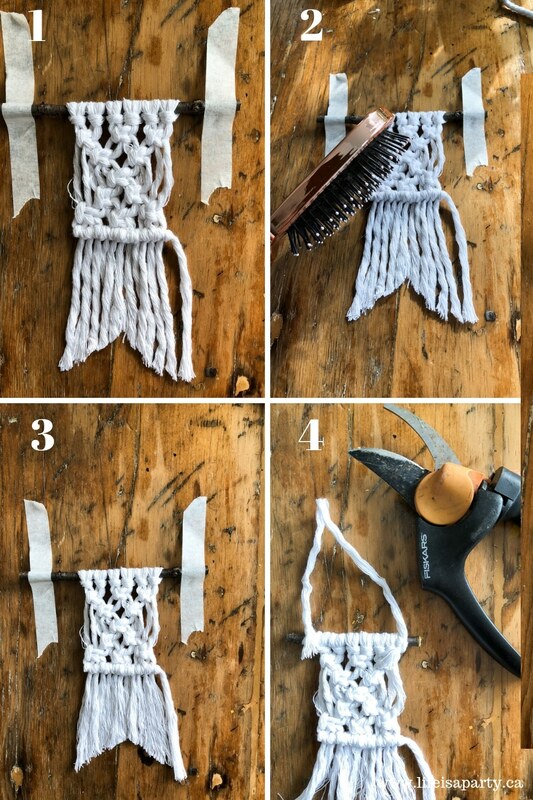 Looks like I need to get practicing my macrame. 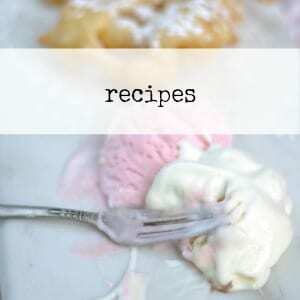 Thanks for sharing and being a part of the blog hop! 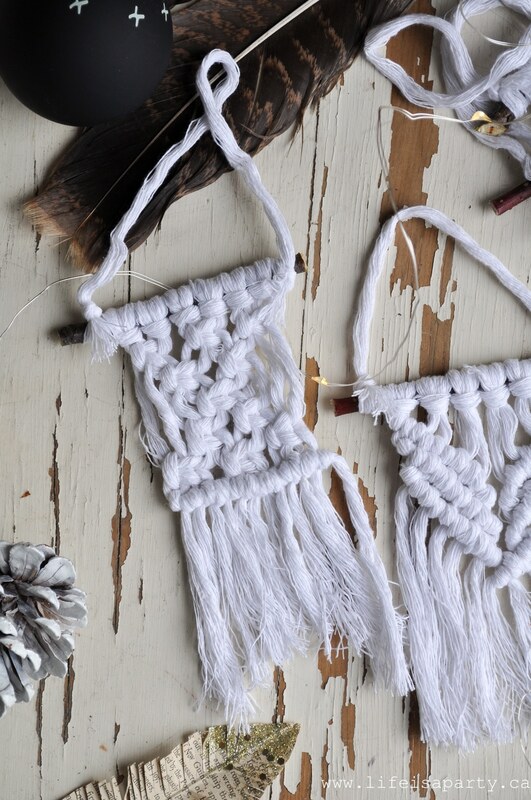 These are so cute and boho! I love them! Natasha, thank you so much.